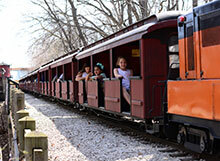 Over 400,000 visitors ride the train’s 19 coaches every year at the Zoo. The train’s route is 1.25 miles, and each of the train’s four engines can log anywhere from 2,000 to 6,000 miles EACH YEAR! A Zoo train trip takes visitors across two bridges, past Lake Evinrude as well as many animal buildings and exhibits—including the Australia building, the North America area, and the Northwestern Mutual Family Farm. The train weighs about 8 tons, yet is surprisingly fast — capable of traveling 60 miles per hour, it usually runs at about 5 to 6 miles per hour. The train’s operating season runs from mid-March to mid-October, weather permitting, and the train and its cars are stored in a heated garage during the off-season. The train was custom-made and donated to the Zoo in 1958 by the publishers of The Milwaukee Journal newspaper. 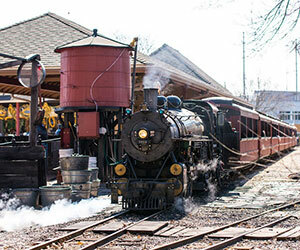 The Zoo has two steam engines and two diesel engines, which are alternated by the engineers depending on factors like weather and Zoo attendance. Although only about one-quarter the size of a standard train engine, the Zoo’s four locomotives operate under the same mechanical principles as their full-size counterparts. The Zoo’s steam engine train is one of just a handful in southeast Wisconsin, and requires 8 to 10 pounds of coal and 10 to 15 gallons of water for each 10-minute trip through the Zoo grounds. The steam engine locomotive requires more skill to operate, as a precise balance of heat and water is needed to maintain the appropriate level of steam pressure. The Zoo employs three locomotive engineers, all of whom have fond memories of riding the train as kids. One of the engineers is 6 foot 5 inches tall, yet manages to squeeze into the train’s smaller cabs! Train engineer Ken Ristow—a certified engineer and mechanic—has been driving trains at the Zoo for nearly 17 years. The train requires daily maintenance during operating season, with Ristow and the other train engineers, Norm Kitchenakov and Mike Kowall, responsible for cleaning, greasing, and oiling the engines to keep them in top shape. Even when the train is stored for the winter, there is much work to do — this is when coaches are refurbished and engines are taken apart for thorough inspection by the engineers. Although operating and maintaining the Zoo train is no easy task, the Zoo engineers love the uniqueness of their job—and the delight on kids’ faces during train rides makes all the work worthwhile!